Northern Ireland's Kyle Lafferty celebrates scoring his goal. Northern Ireland boss Michael O’Neill knows just how significant his side’s win over Azerbaijan could be. 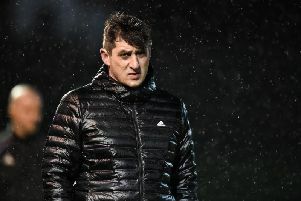 Not just the three points to overtake Azerbaijan and head into second, but the swagger in which it was done could no doubt prove vital in Northern Ireland’s quest to reach Russia. It ended 4-0 and could have been more as the hosts time and time again ravaged a defence that has kept three clean sheets in the first three Group C matches. “The manner is important because we didn’t concede and we play Azerbaijan after Norway so this will still be fresh in their mind,” said O’Neill. Northern Ireland will have plenty of time to reflect on what was a job well done. Croatia do visit Windsor in a friendly on Tuesday evening, but the next World Cup qualifier isn’t until March 26, when Norway come to town. “We’ve had a good start to the group,” continued a pleased manager. “We now have a massive game in March and a win would put us a good distance away from Norway. “Azerbaijan will play Germany and as opposed to being four teams fighting to go to the World Cup with Germany, it might lessen. That’s what we’ve got to do. The fifth game for me is always crucial. Once you get to 10 points, you’re within touching distance of getting enough points to possibly get there. Kyle Lafferty grabbed Northern Ireland’s opener early last night. That was undoubtedly the most crucial moment of the match - unhinging Azerbaijan’s constant defensive strategy. “We worked hard on the opportunities we would get,” said O’Neill. “Azerbaijan are a very organised team but if you let them get into their defensive shape earlier, they’ll be hard to break down in the three games to date. We didn’t do that. “We got the ball forward quickly and turned it into a very British style game and we don’t apologise for that. The quality of the goals, the delivery was very emphatic. The players took on board how we would play against them. O’Neill, unexpectedly, named both Lafferty and fellow forward Josh Magennis in the starting line-up. Magennis played wide right of a front three, with Shane Ferguson pushed up on the opposite flank. And it was a spearhead that cut ruthlessly through the visitors’ back line. “The decision was whether we would play Kyle from the start or from the bench,” said the boss. “I just thought with his aerial presence and dropping Josh onto the right would give us a lot of power and pace in the forward area. Kyle’s still short of match fitness but what he is capable of is getting you goals out of nothing. “He knows his sharpness and fitness isn’t where it could be but the goal he scored is typical of him. He’s off and running in this campaign. He’s got three goals in four games and hopefully that will lead to an improvement in his club situation. And finally, of course, there was a word for the man who bagged his debut goal - along with another outstanding display at right-back. “The decision to leave Conor (McLaughlin) out in Germany was tactical more than anything else,” explained O’Neill. “I thought he was excellent tonight - he was back to the Conor that we saw previously - making great inroads into the opposition’s half, good deliveries, good use of the ball. “I think we saw again what a top player Chris Brunt is as well. Tony Pulis put him straight back into the team and now he’s straight back into ours.